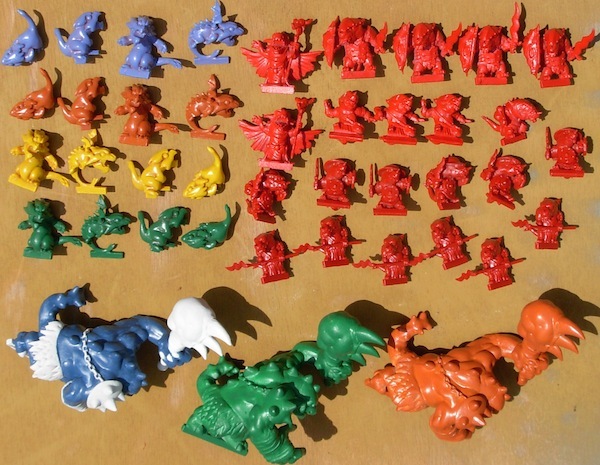 At long last I’ve finished painting up a quorum of the spawn points and their monsters from a pair of the original Super Dungeon Explore box set. 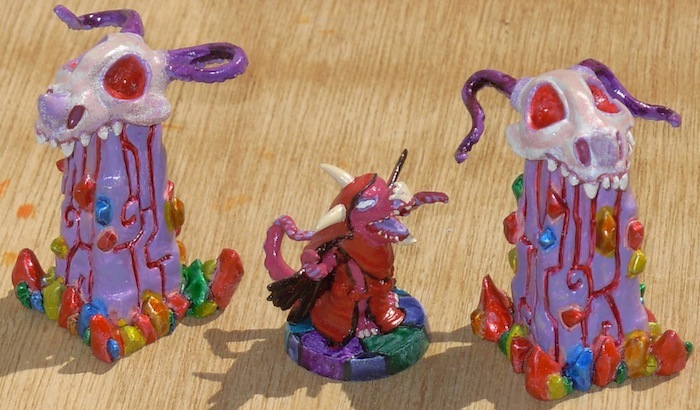 The Kobold Ogre mini-bosses were finished some time ago, and featured in this post. 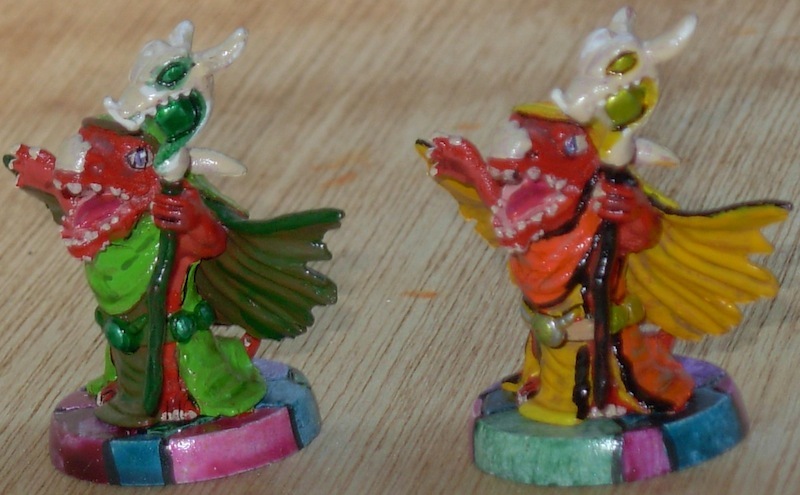 All the gemstone effects on these figures were done by painting a base coat of Chrome Silver, and then adding the particular colours using Model Master acrylic clear paints. 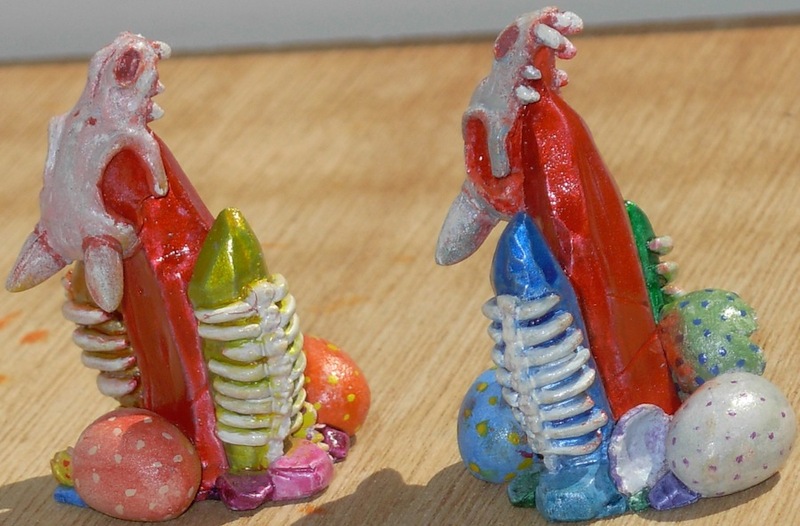 The eyesockets in the spawn point skulls were painted with the clear acrylics just over a white base coat. All outlining is done with .005 Micron Art pens. Each Egg Clutch comes with a single spawn point. The different Clutches are distinguished by colour groups, yellow/orange and blue/green of young Hatchlings, Whelps, and Drakes. 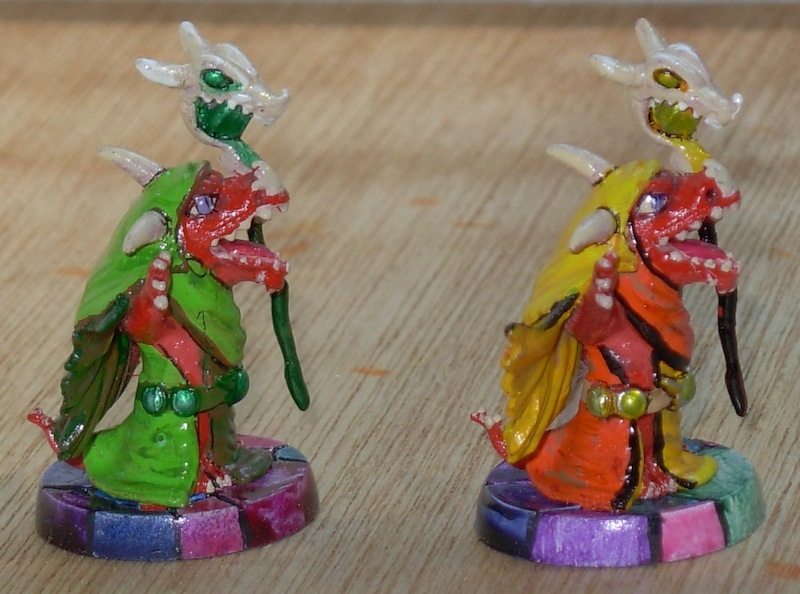 The fourth Kobold Warren is a special group for which I will have to devise custom rules. It will be a smaller group than usual. Several of the Kobold models have already been used for other conversions — one Ironscale went into the body of Boba the Barbarian, one Flinger is currently in progress being turned into an independent Kobold Adventurer. The remaining Kobolds of the group will undergo various modifications. 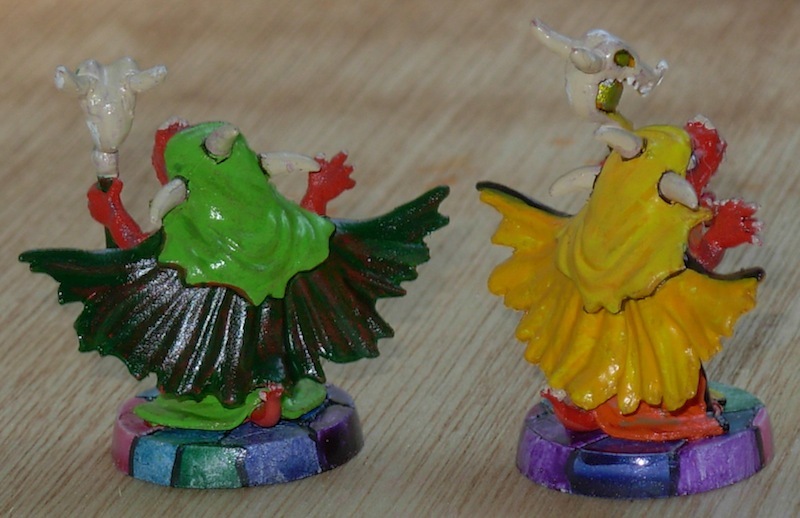 Shown here are the completed pair of spawn points and the Kobold Shaman conversion completed but still in painting progress. This Shaman, of what at one time had been the red Kobold group, has seen things that Kobolds were not meant to know. That arcane knowledge has led to the growing corruption of the spawn points themselves. No one is quite sure how long ago this began. No dungeon mini-boss wants to be the one to file the report with the big boss monster! And finally, another preview of monsters to come. 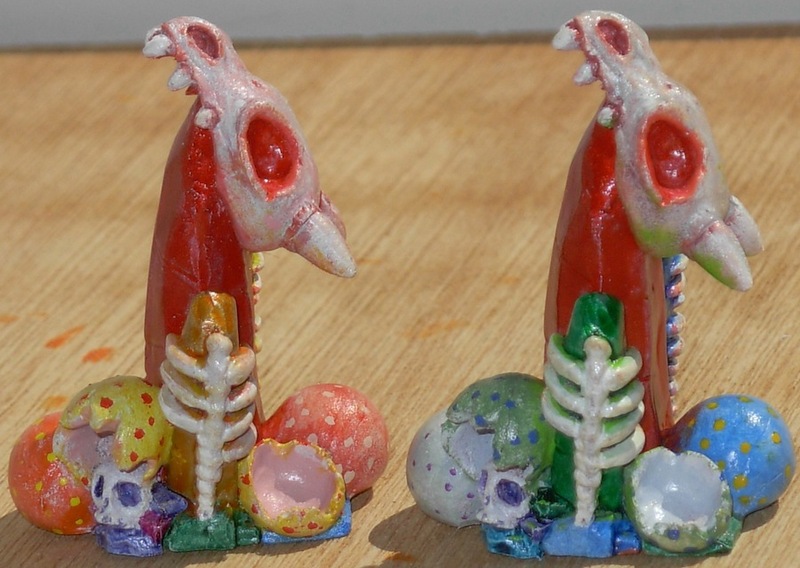 Here are the pair of spawn points for the Shallow Grave pool of monsters from Von Drakk, and also the two menhirs from that set which were originally bases for the Crypt Spiders. (I have one full set of Von Drakk Manor, plus an extra Pumpkin Patch spawn point and several extra skeletons and other figures.) I removed the Spiders from the menhirs and put them on regular bases, so when they move around the dungeon, they don’t have to lug the large stones with them wherever they go. These stones can be used for custom spawn points or just as extra standing stones to place about as terrain features.